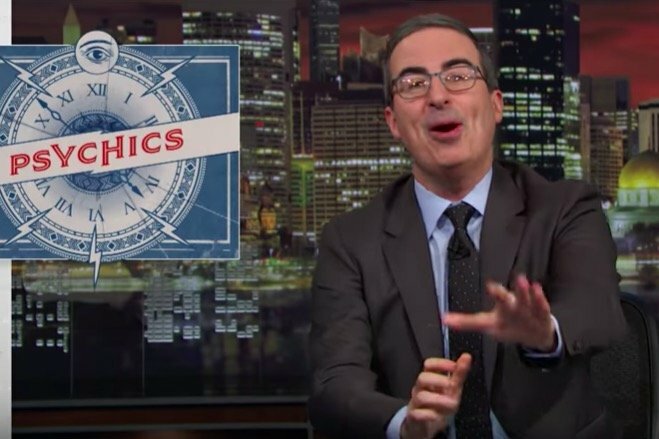 John Oliver goes in on pop culture psychics during "Last Week Tonight." In a departure from politics and the most dismal of world news, John Oliver switched gears for Sunday's "Last Week Tonight," focusing instead on the crazy and, Oliver argued, corrupt world of pop culture's psychics. "Chances are, you haven't really thought about psychics in a while, which is weird – there's not a whole lot else going on," Oliver started. With a reported four-in-10 people believing in psychics, Oliver said that it doesn't matter whether they are legitimate or not – people believe in them, regardless. Oliver said that the companies behind the Psychic Reader's Network (the people responsible for bringing Miss Cleo to the public stage) raked in $1 billion in just three years. That's when Oliver got into the real industry to blame for the public recognition of psychics and mediums: day-time television. Though many psychics will do so-called "cold readings" on TV, trying to sense messages from the dead for random audience members, Oliver suspects there may be some hot readings at play, too – when a psychic does research beforehand. He used Matt Lauer's interaction with Tyler Henry, star of E! 's "Hollywood Medium," as an example. "Look, maybe Tyler Henry genuinely accessed the afterlife, an action which would fundamentally change our understanding of everything on earth," Oliver said. "Or, maybe he just Googled 'Matt Lauer Dad' and hit the f***ing jackpot." Oliver asserted that psychics should only be on TV when they are being busted as frauds.. With that in mind, he then introduced his own day time talk show, "Wakey Wakey with John Oliver."